Please visit the websites of the following airlines for information about flights to Malta. For more information about flights to Malta visit www.maltairport.com. Dear Traveller, Welcome to Porto Azzurro Aparthotel, Malta. Good to know. When booking a minimum of 5 nights by calling (00356) 21585171 (Mon to Fri 9am-4pm local time) or on www.portoazzurro.com.mt or by emailing info@portoazzurro.com.mt you are entitled to: Free Airport-Hotel Transfer on Arrival and Hotel-Airport Transfer on Departure, plus Free Harbour Cruise, departing from Sliema creek (transfers to and from Sliema creek not included). 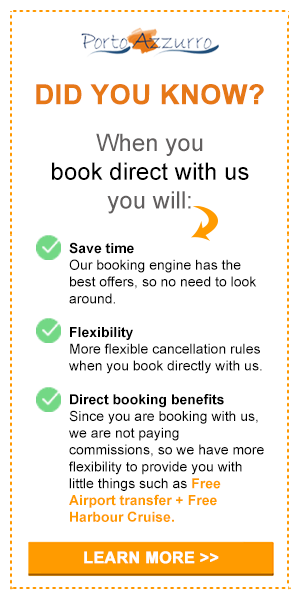 To learn more about your direct booking benefits and terms, click here: Book Direct & Benefit.